It can be difficult to find Page Flip Software that does what you expect, quickly and without issues, This Software does exactly that, It is super quick to load on my Mac, and allows me to quickly generate Page Flip templates for the websites I work on. I have used this in the past as a free version but after looking at the amount of new features in the Paid version I decided to go for the upgrade, Things could not have gone any better, The Mac Installer works great and the software does not take up much room on my HD. I have used a PDF with 1200 pages in High Resolution and this was no problem for Flip PDF for MAC, In addition to this I needed the Page Flip to be HTML5 and Not Flash because of the Responsive user friendly nature of the design of my site, The software allows you to set the order of the Players, HTML5 first then Flash, Also I can use different formats and File exports, I wanted to include a custom logo and do more tweaks after my client seen the results, this was piece of cake for this software and You can be up in no time making page flips for your website. For me using a lot of software for Graphics, this is now a part of my tool kit, It is professional Grade Software, no bugs, it just works. Time is the greatest resource of all for me and as someone who does not have much time to mess about with untested software of Free Demos that are rubbish, I can clarify that this software speeds up my workflow and saved hours of work creating PDF Page Flips for Mac. 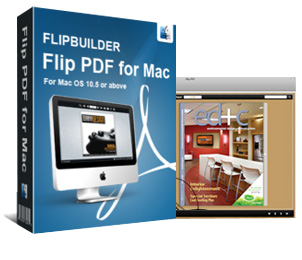 I am happy to endorse this product and recommend any readers give it a try by downloading the free version from the Developers Website..
Flip PDF for Mac makes it fast and easy for Mac users to convert ordinary PDF files into mobile friendly eye-catching brochures or magazines with amazing page-flipping effect. Integrated with hundreds of templates and themes, the Mac program enables you to create unique and impressive digital publications within minutes. Besides, no matter which mode you want to publish your page flipping booklets, online or offline, you can choose the output methods (*.html, *.app) and present your flip books to readers everywhere! Based in Newry, Fully Qualified and Accredited Interactive Multimedia Designer - BSc Hons, Dip. Specialising in E-commerce and Bi-lingual Websites, Graphic Design and Smart phone applications (App Design). Currently Resident at The HUB Newry.